AL Ansar (The Helpers) also known as The Al Ansar Community Group, are responsible for starting the initiative ‘The 28 Day Fajr Challenge’ in light of recent crime within their area of Small Heath and surrounding areas Bordesley Green, Hay Mills and Yardley. They came up with the idea to engage the youth within the community, to educate them and advise them about the effects of gangs, violence and also try and get them fit and active and prevent anti social behaviour. Thus, The 28 Day Fajr challenge has been born. The challenge was aimed at youths under the age of 16, since the majority of the community within the local area of Small Heath are Muslim and receive bad press. Therefore, the idea was conjured as a positive reflection of the Muslim community in Brum, (copied from Turkey in 2017), to start a 28 day challenge in order to complete the dawn prayer in congregation at a local masjid. The idea was to attract the under 16s and give them an incentive: complete the challenge and receive a brand new mountain bike, free of charge. The helpers planned to have 5 minute discussions with the kids/youths and daily discussions about current problems and issues and what the kids could do to become better individuals and be an asset within their own communities. The bikes were a reward and would also help the kids to remain fit, active and healthy. The challenge ran in the month of August, whilst the kids were on school holidays and was completed by 12 kids. 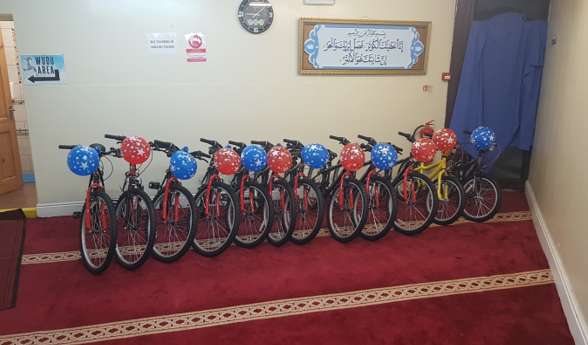 The bikes were purchased from a local shop and funds for the bikes were raised from within the local community’s members and local businesses. It was a successful programme and Al Ansar hope to do something similar in the future.